At first thought, a shoulder injury may not seem like a substantial harm. However, anyone who has experienced the pain of a torn rotator cuff knows that these injuries can require significant medical treatment and result in extensive medical bills. Personal injury law is designed to protect those who have suffered injury due to another’s negligence, providing monetary compensation to cover resulting medical expenses, as well as associated pain and suffering. If you or a loved one has suffered a rotor cuff or shoulder injury due to someone else’s actions, experienced North Dakota shoulder injury lawyers can help you obtain the compensation you deserve. The legal team of Larson Law Firm P.C. assists injured accident victims, and we have a long track record of success securing settlements and successful verdicts. The shoulder joint is surrounded by a group of muscles and tendons called the rotator cuff, which keeps the top of the upper arm bone inside the shoulder socket. Rotor cuff injuries are considered soft tissue injuries and, as such, may be difficult to diagnose. Rotator cuff injuries may include simple inflammation that presents with a dull ache located in the shoulder region, which worsens when resting on that side of your body. A more serious rotor cuff injury, such as a tear, can cause long-term pain and disability. In some of the most severe cases, surgery may be required to repair the tear or replace the joint. A knowledgeable injury lawyer understands that rotator cuff and shoulder injuries can result from any number of accidents, including slip and falls, playground accidents and car accidents. Performing repeated overhead motions can also result in rotor cuff injuries. Athletes are particularly prone to this injury for this reason, especially tennis and baseball players. Certain areas of employment, such as carpentry, painting or window cleaning also require repetitive overhead motions and may result in workplace injuries to the shoulder. Suffering a rotor cuff or shoulder injury is painful. It can also be traumatic and place a heavy financial burden on your family. Don’t suffer alone. 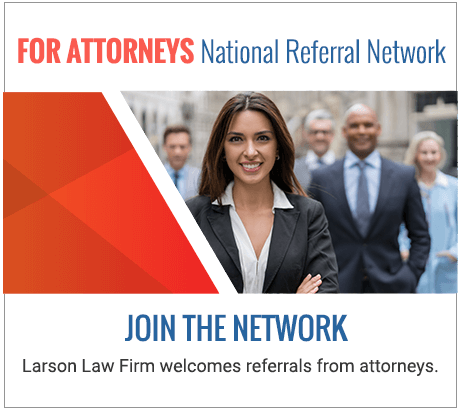 If your accident was caused by negligence on the part of another person or entity, the legal team of Larson Law Firm P.C. aggressively pursues compensation for your personal injuries. From our office in Minot, we proudly represent clients throughout Ward, Williams, McKenzie, Pierce and Mountrail Counties. Call us today to arrange a free consultation at 701-484-HURT or complete our contact form.